Yes, we know you haven't heard from us in a while. Sorry about that, but it's been for a very good reason. Since the Fish Party in August, we've been busy little bees getting ready for the big shipment near Thanksgiving. This year is shaping up well! Here's just a few of the things we've been up to! During September and early October, we collected hundreds (thousands?) of small toiletries and trinkets to build over 300 "Girly Bags" full of things our female military personnel can't always find on ship or operating in a forward area. This is one of our favorite feel-good activities each year. 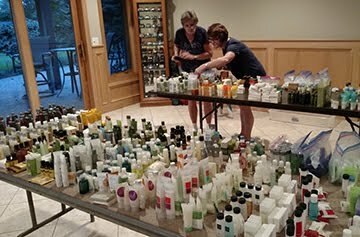 Sheryl and Pam organize toiletry sets . Once Girly Bags are completed and our tables are free for the next project, we begin collecting Halloween Candy to build Holiday Crackers. These pretty little treats not only have lots of candy in them, we also include useful little items, including personal care, drink mixes or hot sauce, and fun things like jokes, riddles, or balloons. 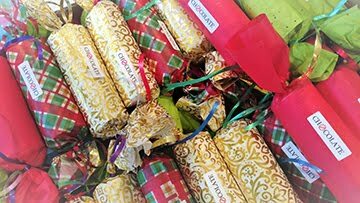 This year we made 1200 crackers, including hundreds of non-chocolate varieties for those deployed to hot environments. Thank you to all the individuals, schools, and clubs who donated leftover Halloween candy and to Brewed Awakenings and Jafferson Computers for being our drop-off locations. We have A LOT of awesome candy! L: Candy collected at Ann Arbor Skyline HS and Eberwhite Elementary. 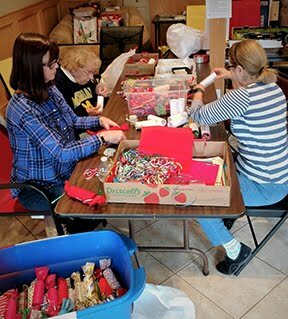 C: Volunteers fill and wrap holiday crackers. R: The lovely results! Finally, once the crackers were finished and our tables were empty yet again, we started inventorying all we'd collected in donations throughout the year and determined what initial items we'd need to buy based on historical purchases. Military needs are usually pretty predictable! Candy, healthy snacks, caffeine, toiletries, entertainment. The beginnings of our PX. Next steps? Gather military names, review their wish lists, purchase special items, and start packing. This is where we are right now in the process. We'll update you with our shipment stats soon. This year's shipment will occur on 11/24.